So who else is working over Christmas? I’m getting some of my best blogging done these days while whizzing from Southgate to central London on the tube and I’m sure this Christmas will be no exception. I no longer work in retail or the service industries so fortunately I don’t actually have to work Christmas Day or Boxing Day like I have in the past but I’ll still be working Christmas Eve and the week between Christmas and New Year. Luckily, the hours at work are quite good at the minute so when I get home in the evenings and swap from suit to pyjamas, there is still plenty of time for me to whip up some sweet treats for the festive period. Yesterday I shared my recipe for Vanilla Fudge and I linked back to the Marshmallow recipe I used last year. Tonight I am sharing Cranberry and Pistachio Nougat. Sweet, chewy nougat is a great carrier for all sorts of flavours, nuts, cherries, chocolate and many more. 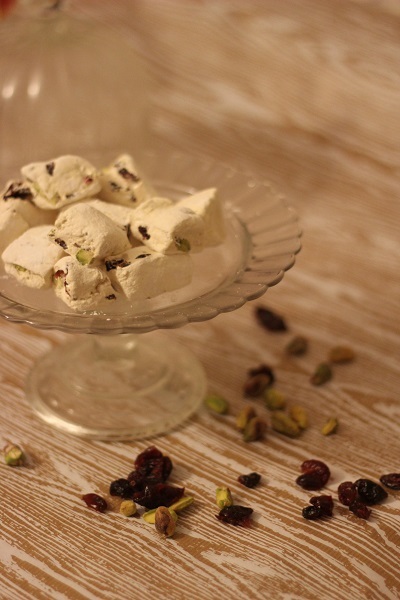 I’ve tried adding a festive twist to a classic nougat recipe. 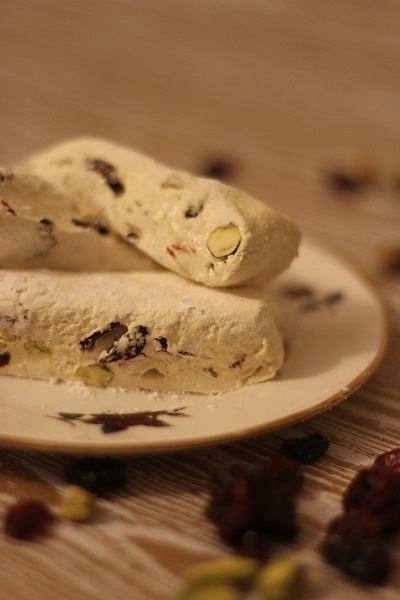 This festive Cranberry and Pistachio Nougat is the perfect treat to put in your Christmas hampers this year! First begin by lining a 20cm square (or rectangular) cake tin with grease proof paper that is dusted with a mix of icing sugar and cornflour (ratio 1:1). Place the honey in a small saucepan on a medium to high heat. When this reaches 108C on a sugar thermometre start whisking your egg whites. Keep whisking until they form stiff peaks. When the honey reaches 120C remove it from the heat. Place the sugar, glucose and water into another small saucepan and again heat on medium to high. Let the sugar dissolve and then bring to the boil. While the sugar syrup is boiling, begin drizzling the warm honey into the egg white while whisking on a low speed. Once all of the honey has been whisked in, turn the electric whisks to a high speed and continue whisking until the sugar syrup has reached 155C on a sugar thermometer. Once the sugar syrup has reached 155C, drizzle this into the egg white mix with the electric whisk on a low speed. Again turn it up high once all of the syrup has been incorporated and keep whisking for 3-4 minutes or until the egg white mix is super thick, glossy and has begun to cool. Finally stir in the nuts and fruit before pouring into the lined cake tin. Smooth down with a hot spatula and dust with more of the icing sugar/conflour mix. Place another sheet of greaseproof paper over the top and squash down with something heavy like a book. Leave to set overnight before cutting into slices or cubes with a hot, sharp knife. Dusting the knife with icing sugar in between cuts will help to prevent it sticking. The key to this recipe is having all of your ingredients laid out and ready to go. In summary, you will be heating the liquid sugar syrup first, adding this to freshly whisked egg whites before heating the glucose and syrup mix and finally adding this to the egg white mix. Stay calm, and be careful. Liquid sugar burns! One word of warning, this mixture gets incredibly thick so it takes a strong electric whisk and some serious arm muscles to keep beating. Also make sure you have lots of icing sugar on hand to dust anything and everything the nougat comes into contact with! Most nougat recipes call for rice paper, but not me. I hate the stuff! So can you make nougat without rice paper? Of course! Instead of rice paper use my mix of icing sugar and cornflour to dust and this will stop it sticking to everything in sight. In terms of texture you’re looking for a firm, chewy marshmallow. This recipe won’t produce brittle nougat. I love how the cranberries are like jewels, dotted throughout the pillowy goodness. The pistachios with their rather festive green, give an added bite to the otherwise chewy sweet. Can you think of any other ingredients you could add to nougat to make for a Christmas confection? I think next year I might like to try morello cherries and dark chocolate chips. Do leave your suggestions in the comments! looks delicious- I love chewy nougat! Maybe try adding some candied chestnuts if you like them? Happy Christmas! :-O I LOVE candied chestnuts how did you know!!! What a fab idea 🙂 Merry Christmas!